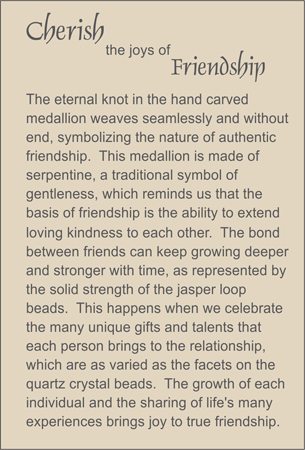 A taupe-colored hand carved serpentine medallion depicting the eternal knot for friendship is beaded onto a necklace of red tiger eye beads alternating with orange aventurine tumbled nuggets. Drum-cut smoky quartz rondelles, and bronze-colored sea pearls provide accents. Sterling silver spring clasp.